If your floors are looking worn or outdated, consider upgrading to stylish and durable luxury vinyl flooring. Unlike the outdated vinyl you may have seen in the past, today’s vinyl is created to give the look of high-end floors. Luxury vinyl plank floors realistically mimic hardwood or natural stone, giving you the upgraded look you want for less. From the look of stone tile to the look of wood planks, our selection of long-lasting vinyl tile will provide just the design element you want for your home. The design team in our showroom will answer your questions and help you find the right vinyl flooring for your project. Our professional installation team makes it easy for you to replace outdated flooring with new vinyl flooring. We’ve got you covered at every step from selection to installation. When it’s time for new floors, you can trust us to give outstanding customer service to make the process smooth and easy. Proper installation is essential to maintain the longevity of your new vinyl floor. To make sure your floor is beautiful for many years to come, we offer professional luxury vinyl flooring installation services from certified installers. Our expert team will install your vinyl floor quickly and skillfully. Our installation service guarantee is one of the best in the industry. Because we are so confident in our installation team, if you encounter any installation problems we will make it right at our expense. We are committed to your satisfaction. Our showroom has a large selection of luxury vinyl plank flooring. If you want the look of solid hardwood in your home, without the worry of cost and maintenance issues, consider wood look vinyl plank. This flooring is a popular alternative to solid hardwood. You can find the same shape, color, and texture that you find in hardwood flooring to create the elegant look you want at an affordable cost. 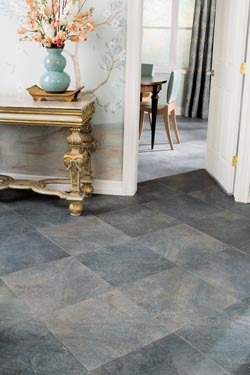 Luxury vinyl tile is designed to resemble today’s most popular tile options. Our showroom offers a wide range of tiles with a luxury vinyl stone look that resembles travertine, porcelain, slate, and marble. Our luxury vinyl floors look great and stand up to the wear and tear of kids or pets. This floor requires only minimal maintenance—no sealing or grout cleaning will ever be needed. Just a quick sweep or mop will keep your vinyl flooring looking like new. Why not choose flooring that is resilient and durable, requires minimal maintenance, is affordable, and gives you the look of some of today’s most popular floors? Contact us today to learn more about how luxury vinyl flooring can make a difference in your home. We proudly serve the homeowners of Sherman Oaks, Studio City, Valley Village, North Hollywood, and Hollywood, California.